San Francisco is the home to two of America’s nostalgic transportation systems, the iconic cable cars and vintage streetcars. This program provides a visual overview of both. Cable cars have been a part of the city as far back as 1873. Only three of the 23 lines that once operated here have been reconstructed and saved for today. Cable cars operate by the use of a “grip” that attaches to a continuously moving cable beneath the surface of the street. We’ll see the cars in action on the Powell/Hyde, Powell/Mason, and the California lines, and visit the central powerhouse, which also houses a car barn and museum, where powerful electric motors operate the cables for all three lines. Today this is the world’s only manually operated cable car system, and certainly a highlight for any visitor to San Francisco! Streetcars all but disappeared from the streets of San Francisco, but came back following the construction of the BART system below Market Street. Popular demand brought back the tracks on the street level, with the F-Line running from the Castro District to the Ferry Terminal. The 1989 earthquake resulted in tearing down the Embarcadero Freeway, which led to extending the line to Fisherman’s Wharf. Today a large fleet of restored cars, including examples from transit companies all over the world and North America ply the F-Line. Many are painted in the livery of streetcar systems that were scrapped many decades ago. Cars are accessible and offer frequent service that also includes modern electric trolley busses to meet high demand.The F-Line has become a major attraction in this remarkable city! 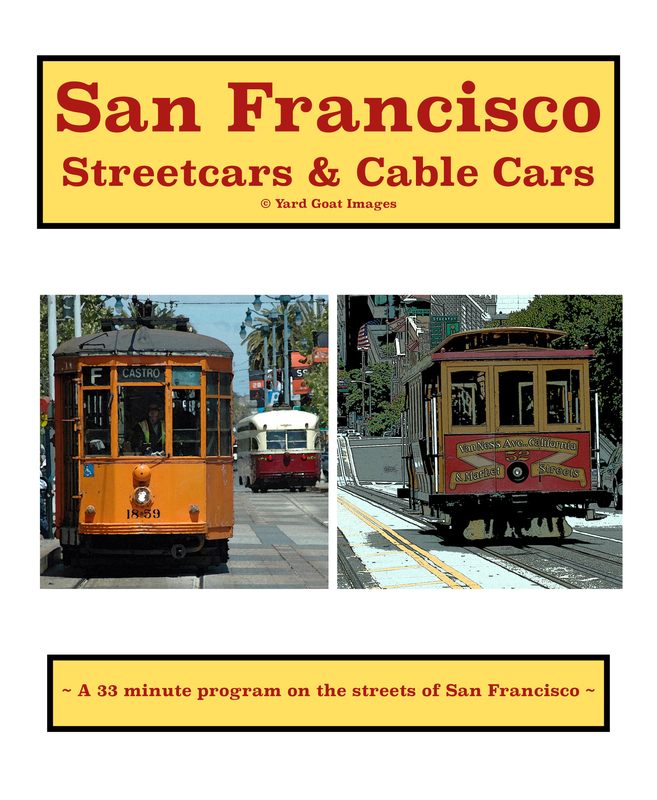 The streetcar and cable car systems of San Francisco connect commuters and tourists with work, shopping, recreation, and sightseeing within the city limits. These cars are colorful, working examples from our past, and powerful symbols of the City by the Bay! San" class="redactor-linkify-object">https://vimeo.com/165700446" >San Francisco Streetcars & Cable Cars - DVD Preview from Yard" class="redactor-linkify-object">https://vimeo.com/yardgoat">Yard Goat Images on Vimeo.